I use this baby monitor for my son. We wanted a monitor that had a camera, but other than that we weren’t really sure what we were looking for when we started shopping. There were so many options to choose from and all of them seemed to have their pros and cons. So what was it that made me choose this one? This monitor comes with a motion pad that goes under the crib mattress. This gave us the piece of mind we needed when we moved my son into his own room. We decided to move him to his own room when he was about 2 months old because I had to go back to work and this was the best solution for our entire family to get as much sleep as possible. The motion sensor measures small movements, including breathing, and an alarm goes off on the camera and the monitor if there is no motion for more than 20 second. The only downside to the motion sensor is that if your baby moves off the sensor to another part of the crib the alarm will go off. 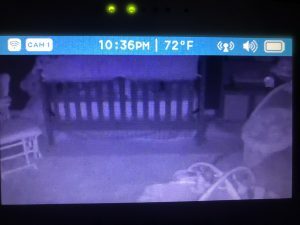 We tried putting my son in his crib a few times for naps during the first few weeks we had him home, but he liked to roll onto his side and off the sensor. As your baby gets older and is able to move throughout the crib on their own, you may want to stop using the senor pad completely. When you stop using the sensor pad, and your baby becomes more mobile, you may want to have more eyes on them. The great thing is that you can expand this system up to 4 cameras that can either be used in the same room or separate rooms. 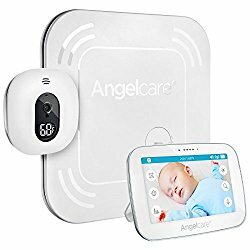 The cameras have night vision so they are great for keeping an eye on your baby at bedtime and they have a temperature display that tells you the temperature in the room. The temperature shows on the camera itself as well as the monitor. I like this feature because keeping the room the appropriate temperature helps reduce the risk of SIDS. The cameras come with a table stand and wall mount so you have a variety of options and can get the best angle on the area you are trying to keep an eye on. I used the wall mount and found it very easy to put up. The touch screen monitor that comes with this setup isn’t anything special. You can get it in a 4.3 or 5 inch screen and the picture on it is adequate but nothing special. It has two way audio which is nice, especially when my husband is with the baby and I need to talk to him. My biggest complaint about the monitor is that the battery life isn’t great. I keep it plugged in next to my bed at night and during the day I have it unplugged and with me where ever I am in the house. It generally doesn’t make it through the entire day and I have to plug it into a portable battery so I can still keep it with me. I also wish there was the ability to use my phone as the monitor so I could view the camera when I am away from home also. Overall I would say this monitor is a great option, especially if your baby has their own room. The piece of mind that it provides far outweighs the negatives. I would recommend starting with the kit that comes with one camera and the sensor pad. Click HERE to buy your own today. If you have any experience with this monitor, or any others, let me know what you think. Please also comment with any questions you have. Next Next post: Should I Give My Baby A Pacifier?